Hogshead Kansas City's executive chef Clark Grant likes to stay ahead of the curve, especially when it comes to the food industry. KANSAS CITY, Mo. — Hogshead Kansas City's executive chef Clark Grant likes to stay ahead of the curve, especially when it comes to the food industry. His latest idea? 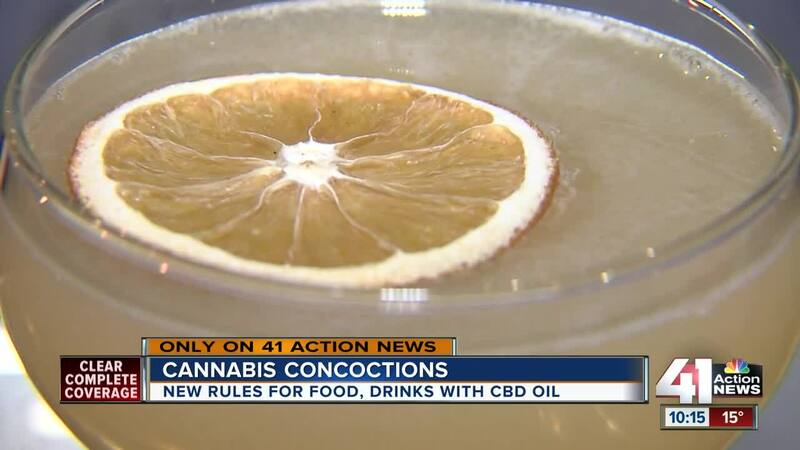 CBD-infused cocktails. "It's something that our guests want. And the people of Kansas City want," said Grant. Last month, Kansas City's Roasterie launched its signature cold brew with a twist—the drink is infused with CBD oil, extracted from hemp. So far, the cans have been flying of the shelves. "We were expecting to put this out and by the summer this would be a really good product," said Craig Park, the Green Coffee Buyer for the Roasterie. "We launched the product and that day people were coming into this cafe and all of our cafes and buying it by the dozen." CBD is a derivative of the cannabis plant. Unlike the chemical THC, it won't get you high. "It's the medicinal side of the hemp plant," said Danielle Friedrich. Friedrich owns Hemp Life Kansas City. Over the last year, she has seen the demand for CBD oil skyrocket. It's a product she says has helped her with anxiety and stress. "There are so many forms of it now. There are edibles and you can drink it," she said. Since the Farm Bill passed and became law in Missouri, there have been questions about whether restaurants and bars could mix CBD-oil with alcohol. 41 Action News contacted Kansas City's Regulated Industries Division to find out the city's regulations. The Regulated Industries Division referred 41 Action News to the state of Missouri's Division of Alcohol and Tobacco Control (ATC). The ATC issued an opinion about CBD and alcoholic beverages at the end of January. According to the state document, ATC has "no legal authority to bar the use of CBD oil in combination with alcohol beverages as long as the oil contains no THC. If the CBD oil has no THC content, it would be considered the same as any other nonalcoholic product." The opinion warns, however, that "there are a lot of unanswered questions since the legalization of CBD oil as it relates to tetrahydrocannabinol (THC)." "To be told no when it was such a gray area, it's nice that we finally get to do it," said Grant. The ATC's opinion now allows Hogshead Kansas City to serve CBD-infused cocktails, which the restaurant plans on showcasing as early as next week.